Monterra in South Palm Desert, CA. Monterra in South Palm Desert is a quality, luxury home community of 95 single family residences built on large estate-size lots high up on Mesa View Drive in South Palm Desert. Monterra is adjacent to the renowned Ironwood Country Club and close to The Reserve, The Vintage and Bighorn Country Clubs as well. This fabulous development is unique with its wind protected location, manned 24 hour security, and panoramic mountain and down valley views. Each home is beautifully maintained, with manicured yards lining the pristine private streets of the community. 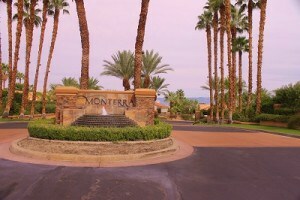 Monterra is a gated, non-golf course community with low HOA’s. With the Desert’s best shopping just five minutes away, Monterra is an ideal place to live for a fortunate few. Fashionable El Paseo offers fine dining, upscale shopping, entertainment, galleries and boutiques. Also close by are the Living Desert, the McCallum Theatre, Eisenhower Medical Center and much more. The Palm Springs International Airport and I-10 freeway are easily 25 minutes away. With Monterra, it is Location, Location, Location !!! Monterra consists of 95 luxury homes built on estate-size lots behind impressive gates with 24 hour manned security. This rare jewel in the desert was built in the late 1980’s, with homes featuring mostly 3 to 4 bedrooms with 4 to 5 baths. Home sizes range from approx. 2,800 sf to approx. 3,225 sf and lot sizes are from approx. 12,200 sf to approx. 18,300 sf. HOAs run $238/mo., including upkeep of the private streets and 24 hour security. People who like Monterra also tend to enjoy Montecito, Regency Estates, Vista Paseo and Tierra Vista.